Standard edition cover art featuring the 2018 Porsche 911 GT2 RS with the Weissach Package equipped. Gameplay in Forza Motorsport 7. Here the player competes in truck racing at Mugello Circuit. Forza Motorsport 7 was developed by Turn 10 Studios alongside the Xbox One X console, with Turn 10 providing the Xbox hardware team with feedback. In mid-November 2017, the Xbox hardware team supplied Turn 10 with a prototype Xbox One X system. Turn 10 was able to get their ForzaTech demo running on the system within two days after receiving the prototype console. The game runs at 4K resolution and 60 frames per second, while running at 1080p at similar frame rate on the base Xbox One models. The game does not feature any Toyota and Lexus production road vehicles due to licensing issues between the manufacturer and most non-Japanese video game developers that lasted from 2017 to 2018. Only the company's selected race and pre customized vehicles including 3 Camry NASCARs, Eagle MkIII, the Arctic Trucks Hilux, Toyota T100 SR5 Trophy Trucks and the Subaru BRZ are featured, then Land Cruiser Arctic Trucks featured via DLC. However, Volkswagen returns after being absent in Horizon 3, with some models being brought over from Horizon 2 and Motorsport 6, as well as some new inclusions. Forza Motorsport 7 was announced at Microsoft's press conference during E3 2017 on June 11. The 2018 Porsche 911 GT2 RS was revealed alongside the game as part of a six-year licensing deal between Microsoft and car manufacturer Porsche. The game launched simultaneously on Windows 10 and Xbox One, and is slated to be available at launch for the Xbox One X. However, the OneDrive music support will be announced 'at a later date'. The first monthly car pack called the "Samsung QLED TV Forza Motorsport 7 Car Pack", was released on November 7, 2017. That DLC includes one more Toyota vehicle, the Arctic Trucks Land Cruiser. Forza Motorsport 7 received "generally favorable" reviews, according to review aggregator Metacritic. In Game Informer's Reader's Choice Best of 2017 Awards, the game took the lead for "Best Racing Game", while it tied in third place with Slime Rancher for "Best Microsoft Game". It won the award for "Best Racing Game" in IGN's Best of 2017 Awards, whereas its other nominations were for "Best Xbox One Game" and "Best Graphics". "Slightly above average or simply inoffensive. Fans of the genre should enjoy it a bit, but a fair few will be left unfulfilled," was Peter Glagowski's conclusion on Destructoid with a score of 7/10. 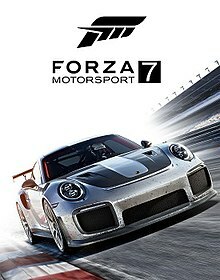 7.5/10 was Ray Carsillo's score on Electronic Gaming Monthly; he said, "Forza Motorsport 7 is a really great racing game—it’s just a shame that changes to the game’s currency system undermine a fair amount of what it does right. It’s made racing feel more like a grind than in years past and no amount of new tracks or cars will change that." Justin Towell from GamesRadar gave the game a score of 5 out of 5 stars saying that "Forza Motorsport 7 addresses every issue of its predecessor, turns the visual flair up to 11 and handles like a dream. An essential purchase." Luke Reilly said on IGN "Forza Motorsport 7 is Turn 10's finest love letter to speed and style this generation", and awarded it a score of 9.2/10. James Davenport's 82/100 score on PC Gamer stated, "Light performance problems and a poor loot box system can't quite distract from Forza Motorsport 7's accommodating difficulty, stunning beauty, and lavish racing options." Colin Campbell's score of 8.5/10 on Polygon said that "This is a game for everyone who loves racing. It offers every helping hand to those who want to just throw themselves around bends, while allowing die-hards to tinker with their rides, and really feel like they are there." ^ Parijat, Shubhankar (12 June 2017). "Forza Motorsport 7 Dev: Xbox One X Allowed Us To Reimagine the Racing Experience". GamingBolt. Retrieved 12 June 2017. ^ Chalk, Andy (23 June 2017). "Forza Motorsport 7 studio Turn 10 is 'learning how to become PC developers'". PC Gamer. Retrieved 23 June 2017. ^ O'Kane, Sean (11 June 2017). "Forza Motorsport on Scorpio: the full story". The Verge. Retrieved 11 June 2017. ^ a b c d O'Kane, Sean (11 June 2017). "Forza Motorsport 7 first look: the series refocuses on its drivers". The Verge. Retrieved 12 June 2017. ^ a b c d Welsh, Oli (11 June 2017). "Forza Motorsport 7 out in October, has trucks". Eurogamer. Retrieved 12 June 2017. ^ a b Leadbetter, Richard (9 April 2017). "Forza Motorsport on Scorpio: the full story". Eurogamer. Retrieved 12 June 2017. ^ Tsui, Chris (27 August 2017). "Forza Motorsport won't include any Toyota road cars". The Drive. Retrieved 6 September 2017. ^ "Forza Motorsport - Forza Week in Review 8-4-17". www.forzamotorsport.net. Retrieved 2017-11-25. ^ a b "Forza Motorsport 7 for PC Reviews". Metacritic. Retrieved October 4, 2017. ^ a b "Forza Motorsport 7 for Xbox One Reviews". Metacritic. Retrieved October 4, 2017. ^ a b Glagowski, Peter (October 16, 2017). "Review: Forza Motorsport 7". Destructoid. Retrieved October 16, 2017. ^ a b Carsillo, Ray (October 10, 2017). "Forza Motorsport 7 review". Electronic Gaming Monthly. Retrieved October 10, 2017. ^ Kato, Matthew (October 7, 2017). "Restrictor Plated - Forza Motorsport 7 - Xbox One". Game Informer. Retrieved October 7, 2017. ^ Concepcion, Miguel (October 3, 2017). "Forza Motorsport 7 Review". GameSpot. Retrieved October 3, 2017. ^ a b Towell, Justin (October 2, 2017). "Forza Motorsport 7 review". GamesRadar. Retrieved October 2, 2017. ^ a b Reilly, Luke (September 30, 2017). "Forza Motorsport 7 Review". IGN. Retrieved September 30, 2017. ^ a b Davenport, James (October 3, 2017). "Forza Motorsport 7 review". PC Gamer. Retrieved October 3, 2017. ^ a b Campbell, Colin (October 4, 2017). "Forza Motorsport 7 review". Polygon. Retrieved October 4, 2017. ^ Cork, Jeff (January 4, 2018). "Reader's Choice Best Of 2017 Awards". Game Informer. Retrieved January 19, 2018. ^ "Best of 2017 Awards: Best Racing Game". IGN. December 20, 2017. Retrieved January 5, 2018. ^ "Best of 2017 Awards: Best Xbox One Game". IGN. December 20, 2017. Retrieved January 5, 2018. ^ "Best of 2017 Awards: Best Graphics". IGN. December 20, 2017. Retrieved January 5, 2018. ^ "Game Critics Awards: Best of E3 2017 (2017 Winners)". Game Critics Awards. Retrieved January 5, 2018. ^ "Super Mario Odyssey sweeps Best Of Gamescom awards". Metro. August 24, 2017. Retrieved January 19, 2018. ^ Makuch, Eddie (January 14, 2018). "Game Of The Year Nominees Announced For DICE Awards". GameSpot. Retrieved January 19, 2018. This page was last edited on 27 January 2019, at 14:39 (UTC).